People gathered on the National Mall to listen to speeches at the Justice or Else rally Saturday. Speakers included Louis Farrakhan, the leader of the Nation of Islam. 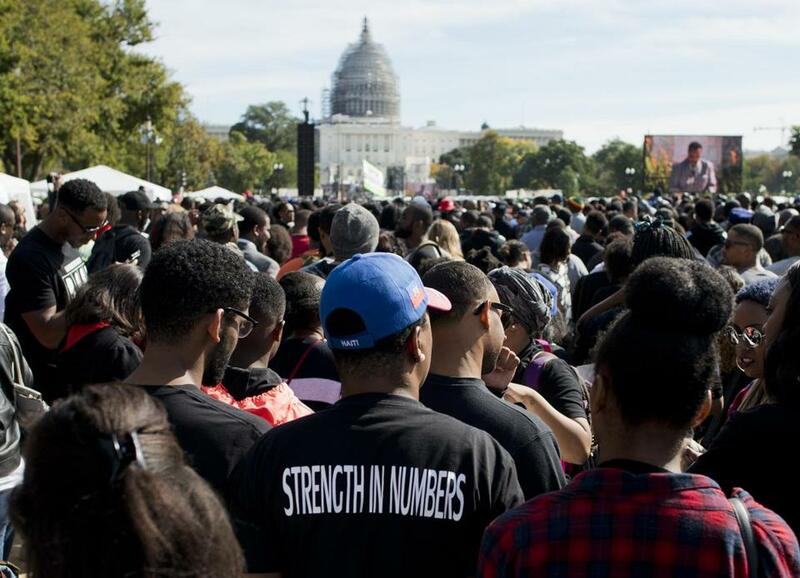 WASHINGTON — Thousands of black men, women, and children gathered on the National Mall on Saturday to demand justice at a time of growing anger and fraying tensions in African-American communities across the nation over the police shooting deaths of young black men. Crowds began forming on a cool, sunny morning just beyond the west front of the Capitol, and by noon the number of participants had swelled significantly, with onlookers watching on several jumbo screens set up along the lawn. Some people set up lawn chairs, and others sat on blankets to listen to a long lineup of speakers, including Louis Farrakhan, the leader of the Nation of Islam, which sponsored the “Justice or Else” rally. The event marked the 20th anniversary of the Million Man March in 1995, when hundreds of thousands of black men rallied on the Mall. Although the crowd Saturday was expected to be far smaller than that protest, the spirit of the first movement was echoed by the those who addressed the crowds. But the speakers also pointedly tied the struggle of the black community to modern-day incidents. Tamika Mallory, a national organizer of the rally, recited a litany of young black men who have been killed by police in recent years, including Tamir Rice of Cleveland; Michael Brown of Ferguson, Mo. ; and Eric Garner of Staten Island. “Twenty years ago, the death of Tamir Rice would have fallen on deaf ears and left for the police to write a false report, not broadcast for the world to know,” Mallory told the crowd. “America, we can’t breathe,” Mallory said, echoing the phrase that Garner uttered while being held in a chokehold by police in July 2014 and that has been appropriated by the civil rights movement. Signs of the community’s frustration were written on T-shirts for the “Black Lives Matter” movement and on posters reading “Straight Outta Patience.” One man wore a “Hands up, don’t shoot” T-shirt, marking the rallying cry in Ferguson after residents and police clashed in the wake of Brown’s shooting death in August 2014. “Are we going to demand justice?” the Rev. Willie Wilson of Newport News asked the crowd. Some spoke about other calls for justice. D.C. Council member Vincent Orange took his turn at the microphone to make an impassioned call for voting rights and statehood for the District, which lacks representation in Congress. “D.C. statehood or else,” Orange said. Dennis Muhammad, 45, of Charleston, S.C., was sitting on a lawn chair watching the speakers on the big screen. He had arrived on a bus with about 55 members of his community early Saturday morning. He mentioned Walter Scott, a South Carolina man killed in a police shooting in North Charleston in April whose family recently received a $6.5 million settlement from the city.